Dynamic Forge & Fittings (I) P. Limited is highly acclaimed manufacturer of pipe fittings & flanges. Dynamic Forge & Fittings (I) P. Limited, produces the flanges which meet all international quality standards such as DIN, EN1092-1, BS4504, ANSI, API, MSS, AWWA, UNI, JIS, SANS, GOST, NFE, ISO, AS, NS etc. We are manufacturing 75lbs, 150lbs, 300lbs, 600lbs, 900lbs, 1500lbs, 2500lbs, PN6, PN10, PN16, PN25, PN40, PN63, PN64, PN100, GOST 12820 and GOST 12821, PN0.6MPA, PN1.0MPA, PN1.6MPA, PN2.5MPA, PN4.0MPA, SANS1123 or SABS1123, 600kpa, 1000kpa, 1600kpa, 2500kpa, 4000kpa flange ratings as per application or client’s requirement. The ASME B16.5 Ring Type Joint Flanges (RTJ) ratings are very important for flanges application, correct flanges rating will keep the application safe. Dynamic Forge & Fittings (I) P. Limited specializes in manufacturing high pressure, large diameter, high yield, and specialty flanges. ASME B16.5 Ring Type Joint Flanges (RTJ) are manufactured using superior grade of steel like Carbon Steel, Alloy Steel, Stainless Steel 201/202, 304/304L, 310S, 316/316L, 317L, 321/321H, 347/347H, 904L. These Flanges are most durable and manufactures to fit in different size of Pipes. The majority of our flanges are manufactured from forged steel with a limited amount machined from bar stock. The forged construction provides higher strength and durability to provide long lasting performance in the application. Do you need your ASME B16.5 Ring Type Joint Flanges (RTJ) or other pipe flanges shipped to you internationally? Not only do we ship all of our fittings & flanges globally, we will consolidate the order for you and ship it to the closest port near you. We have gained several Orders of ASME B16.5 Ring Type Joint Flanges (RTJ) from countries like US, Canada, Chile, Brazil, UK, Italy, Belgium, France, Portugal, South Africa, Nigeria, United Arab Emirates (UAE), Bahrain, Saudi Arabia, Qatar, Kuwait, Jordan, Malaysia, Thailand, Singapore, Indonesia, Sudan, Kazakhstan, Australia, Israel, Kenya, Russia, Tunisia, Vietnam, Colombia, Sri Lanka, etc. Should you like to send you next enquiry for ASME B16.5 Ring Type Joint Flanges (RTJ) to Dynamic Forge & Fittings (I) P. Limited, please send us an email. 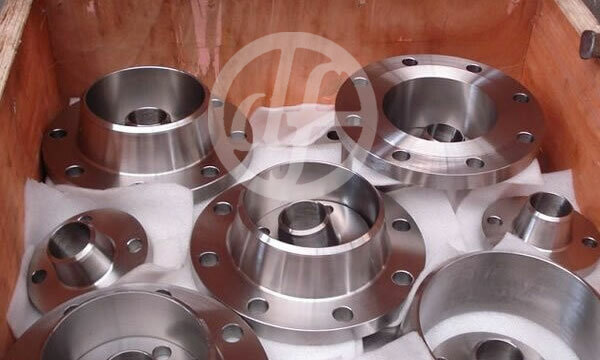 Nickel Alloys ASME B16.5 Ring Type Joint Flanges (RTJ): Nickel 200 (UNS No. N02200), Nickel 201 (UNS No. N02201), Monel 400 (UNS No. N04400), Monel 500 (UNS No. N05500), Inconel 800 (UNS No. N08800), Inconel 825 (UNS No. N08825), Inconel 600 (UNS No. N06600), Inconel 625 (UNS No. N06625), Inconel 601 (UNS No. N06601), Hastelloy C 276 (UNS No. N10276), Alloy 20 (UNS No. N08020), Titanium (Grade I & II). Dynamic Forge & Fittings (I) P. Limited emphasis on the packaging to ensure that there is no damage during transit the ASME B16.5 Ring Type Joint Flanges (RTJ). The ASME B16.5 Ring Type Joint Flanges (RTJ) are packed in wooden corrugated boxes foiled in bubble wraps & are marked with Grade, Lot No, Size, Degree and Dynamic Forge & Fittings Brand Mark. You can also contact us for customized marking. 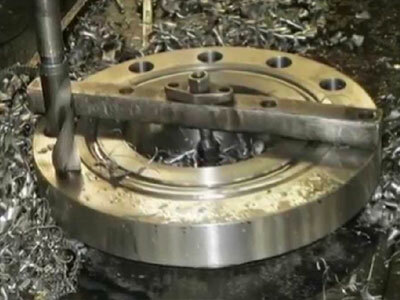 The classes for Ring–Joint, Tongue & Groove, and Raised-Face flanges are 150# ,. B16.47 delineates its flanges into pressure classes 75, 150, 300, 400, 600, 900.. For example, the maximum p. 600. NPS, Class 900. NPS, Class 1500. NPS, Class 2500. NPS, Groove No.. . (2 ) For ring joints with lapped flanges in Classes 300 and 600, ring and groove .Class 900 Facing Dimensions for Ring Joint Flanges: For sizes 1/2” thru. . 600. 1 /2. 1 11/32. 1/4. 3/8 .170. 9/32. 7/32. 2. R11. 1/8. 1/8. 1/8. 3/4. 1 11/16. 5/16. 1/2.Unless other wise specified by the customer, Ring Type Joint Flanges will be. Class 300. Class 400. Class 600. 1/2. 34.1. 6.4. 11.1. 9.5. 4.3. 7.1. 5.6. 50.8. R11.Approximate Weights of Class 600 Flanges. Raised Face, Class 400 and above Flat Face, RTJ,. Tongue, Groove. . DIMENSIONS OF RING JOINT FLANGES.Ring Joint Flange Facing Dimensions. Class 150 |Class 300 | Class 400 | Class 600 | Class 900 | Class 1500 | Class 2500 . Class; 75; 125; 125LW; 150; 175; 250; 300; 350; 400; 600; 900; 1500; 2500; AWWA. AWWA Ring; BLIND; Blind for IS SO; Blind for IS WN; EB; HB; LAP- JOINT . 2 Welding Ends (Welding Neck Flanges With Backing Rings) .. . 28 Dimensions of Ring–Joint Facings .. 39 Dimensions of Class 600 Series B Flanges .Pipe Class Grf’ove Ring & I 1 s’se 1 8’9 t W’dth Of. Size Groove Depth Width Radius 369 Wldth Oval Octagonal Flat. Number P E F R K A B H 0. 300-600 R 11 . Dimensions of Ring Joint Facings: Classes 300,400 and 600 – 1/2″ thru 6″ · Classes 300,400 and 600 – 8″ thru 36″. Welding Neck Flanges: Class 150 ·Class 900.